I find myself bringing my mobile office to a nearby Borders whenever the mood strikes me. 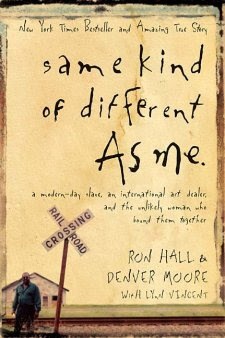 I can recall quite a few times where I caught a glimpse of the book "Same Kind of Different as Me" on the bookshelves. 1) It is a New York times bestseller. 2) It is a true story. 3) It tells how a homeless African-American man crossed paths with an affluent white couple and changed each others' lives forever. 4) I am pretty sure it will be turned into a movie and I wanted to read it before I see the "Hollywood-ized" version. I was just having a lunch with a really good friend yesterday and he said something that really captured my heart: "I long for the day where the world has no countries and we all just lived in alignment, in agreement, and in harmony with one another." If you want to see that extraordinary vision in a specific situation, the story of Ron Hall and Ron & Deborah Moore will certainly give you that. I am a lover of the narrative form of story-telling, which makes this book difficult to put down. I have been guilty of passing on judgment to other people and deciding that "I have nothing in common with that person. Therefore, I am unable to have a meaningful relationship with him/her." When I think of the story of Ron (who was born into a family of slaves) and Denver (who grew up privileged); and how a friendship seemed impossible; and yet Deborah believed otherwise -- I knew that I need to constantly battle that mindset and allow God to bring people into my life with any doubt. I am grateful for that lesson and I consider myself blessed to have gotten the chance to see a story of friendship that is triumphant over race and social status. Hope you're doing great Sam! We are doing great over here. How I wish we can visit Seattle!